to make products that meet Japan quality levels. which customers and society need, and satisfy them. We use a brand symbol and colors that visually symbolize the OHTAKE brand. Our brand symbol rectangle is designed like a treadmill, which is a main business for our future, creating value for OHTAKE Root Kogyo. The OHTAKE brand logo "O" is designed like a screw head, for automatic screw feeders which is our other main business. Our brand symbol rectangle expresses the solid path that the OHTAKE brand will advance on; “+” in the logo’s "O" is our company sprit to boost quality and always meet customer needs. Our blue brand color means OHTAKE Root Kogyo’s unlimited creativity and technical abilities. Our brand slogan expresses the OHTAKE brand concept. “Japan Quality Since 1968”. We work to boost Japanese quality, making full use of the creative and technical abilities unique to OHTAKE Root Kogyo, and constantly respond to customer needs throughout the world. 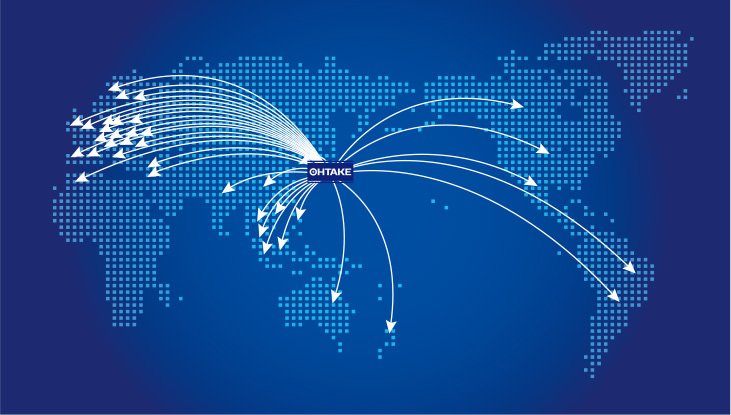 OHTAKE brand can be sold and trusted in more than 30 countries worldwide.